AS Bank Negara Malaysia governor Datuk Nor Shamsiah Mohd Yunus walked into the hall last Friday, she was greeted by a frenzy of camera flashes as media photographers tried to get a good shot of her at her first quarterly gross domestic product press conference as governor. 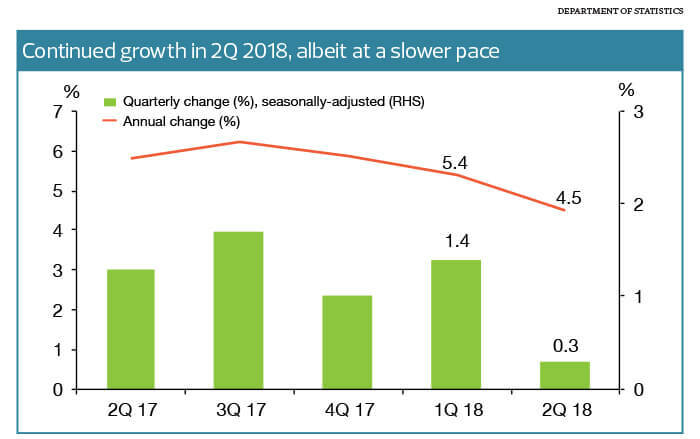 It had already been anticipated that the GDP data for the second quarter (2Q2018) would not be as robust as the first, but 4.5% year on year would have surprised many as it was below every economist’s expectation. Bloomberg’s consensus forecast was 5.2%. Shamsiah also said that Bank Negara had lowered its 2018 full-year GDP forecast to 5%, below its projection of 5.5% to 6% earlier in the year. The new forecast of 5% is also below economists’ consensus of 5.3%. The full-year consensus forecast ranges from 4.7% to 5.8%. However, these estimates could have been made before any revision following the 2Q2018 numbers. The governor said the central bank’s latest forecast takes into account the ongoing China-US trade tension in its current form and the potential 50 basis point reduction in global growth by 2020 as a result of the trade war, as forecast by the International Monetary Fund. “The actual growth performance in 1H2018 was lower than earlier projections. At this point, we observe growth weakness due to specific factors, and not generalised throughout the economy,” Shamsiah said at the press conference. A prolonged disruption of oil and gas production due to supply outages in Sabah and Sarawak and weak crude palm oil (CPO) production have been named as the main factors that have been constraining growth. The shocks to the mining sector are expected to linger until the end of the year, before production returns to normal capacity early next year, Shamsiah said. As for CPO production, there has been a resumption of production capacity and it will likely turn around in the third quarter. The saving grace has been private sector activity, which has remained stable. Notably, private consumption grew 8% y-o-y in 2Q, up from 6.9% in 1Q while private investment growth advanced significantly to 6.1% y-o-y from a mere 0.5% in the preceding quarter. “Consumption is going to be very, very strong in 3Q because of the tax holiday. One of the bright spots in 2Q is a turnaround in private investment, which was very small in 1Q but has turned around to 6.1%. This is the kind of investment we are looking at — more private sector activity led growth,” Shamsiah said. While net exports suffered from weak commodity exports due to production weakness in 2Q, the central bank expects export performance to remain firm going forward on the back of continued demand from major trade partners, support from the global technology cycle and expanded production capacity. Net exports for 2Q grew by only 1.7% y-o-y, compared with 62.4% in the preceding quarter. Despite the lower revised GDP growth forecast of 5%, Shamsiah stressed that growth remains firm and Malaysia continues to be one of the fastest growing economies in the region. Going forward, she says, growth momentum will be supported by three factors: (i) sustained global growth and trade momentum, which will support trade activity; (ii) private sector spending, which is expected to benefit from positive spillovers from external demand; and (iii) household spending that is supported by favourable labour market conditions and additional spending during the tax holiday. “The steady growth path of the economy is supported by sound macroeconomic fundamentals. 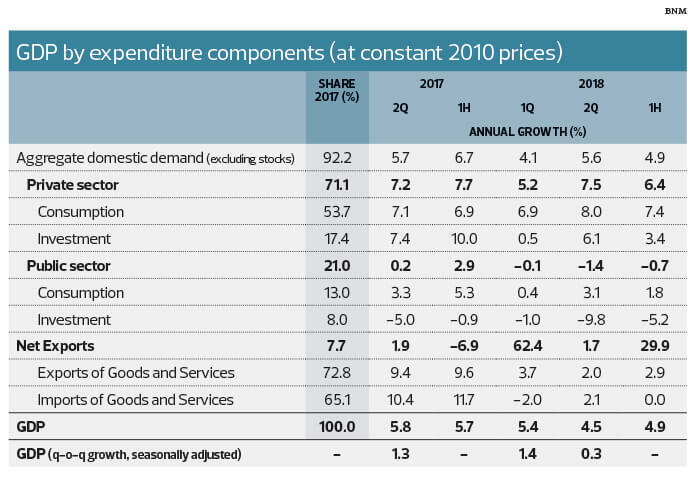 The economy is well-diversified in terms of sources of growth as well as export products and markets. Labour market conditions remain favourable, underpinned by wage and employment growth, the current account continues to register a surplus and Malaysia’s deep financial markets with strong financial buffers will ensure orderly market conditions in the face of financial market headwinds. “Given these sound fundamentals, Malaysia is well placed to undertake deeper structural reforms that will place the economy on a firmer footing to withstand medium to long-term global and domestic challenges,” she emphasised. Looking at inflation, the central bank expects it to moderate. When asked how the implementation of the Sales and Services Tax would impact inflation, the governor said it would depend on pricing behaviour and how traders pass on the cost to consumers. Nevertheless, the impact is expected to be much smaller than that of the Goods and Services Tax. Many questions on the federal government’s financial position were asked as well. She also said the government has recognised that the removal of GST has narrowed the revenue base and it is looking to expand it. More clarity on this will be available during the tabling of Budget 2019 in November. “The entire medium-term strategy that the government will embark on to ensure that the fiscal position is sustainable over the medium term [will be announced during the budget]. Bank Negara is part of the team that is crafting this medium-term strategy,” she added. The issue of foreign insurers paring down their stakes also came up during last Friday’s press conference. Earlier, the central bank had imposed a June 30 deadline for foreign insurers to reduce their stakes to 70%. The central bank said the objective of divestment remains intact for those foreign insurers who had committed to divesting 30% of their stakes about 20 years ago, but it will be approaching the divestment issue based on bilateral agreements between the insurance companies and Bank Negara. “The divestment commitment was ... made to the central bank … it was their commitment to divest. We are still in discussions. The objective of that divestment is still relevant,” Shamsiah said. The central bank is looking to achieve a “speedy resolution” with the insurers. Nevertheless, she said that certain divestment options taken by some foreign insurers could be more complicated than others, hence the need for a more flexible deadline.